• We are also capable of pouring any other copper-based alloy. 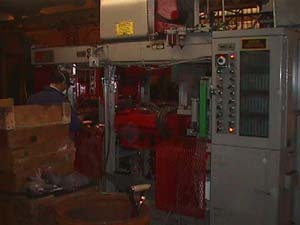 • Our process is completely automated so that labor-intensive castings are simplified. Our core machines and molding lines yield more than 20,000 cores and 2,000 molds per shift. Four electric furnaces ensure that the castings have porosity-free surfaces. Castings are trimmed rather than handground. • American Bronze has supplied machined castings to many of its customers for decades. 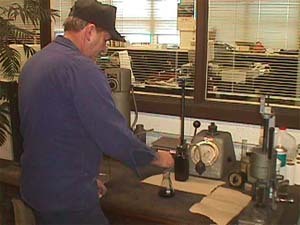 Machining your castings is no problem at American Bronze. • Machined castings are then tested at American Bronze using water pressure leak detection stands. • Quality control is our chief priority. In 2005, we purchased a state of the art Hartley Sand Control System to analyze every single batch of sand we use. We also check our sand manually each day for strength, compactibility, and permeability. Within 20 minutes of production, first castings are inspected by ultrasound to test both wall thickness and strength. • We have an in-house quality program that uses many standards that are similar to ISO 9000. Quality sand testing means quality castings every time. JIT delivery starts with automatic molding machines.